Hotel Gran Casa Xalisco offers unique accommodations in the center of Guadalajara, a few blocks from the Cathedral and historic monuments, and just in front of the beautiful Saint John Baptist Church. The hotel is built in a beautiful house with a large center courtyard, dating back to 1895. It had, from many years, served as an industrial factory, and even a clandestine convent in the Cristero era. With ten guestrooms, two of which are master suites that have Jacuzzis and kitchenettes for longer stays, Hotel Gran Casa Xalisco offers everything needed for a pleasurable visit to Guadalajara. The hotel has a an on-site restaurant, a bar/lounge, 24-hour business center, complimentary WiFi in rooms and public areas, free parking, concierge services, and laundry services. Hotel Gran Casa Xalisco is the fourth hotel of the Grupo Bosque, that has been serving guests for more than 15 years. 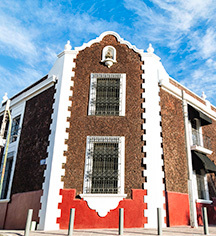 Located in the traditional neighborhood of Mexicaltzingo, the hotel offers a unique experience for business and leisure travelers. From this convenient central location, all points of interest is only “fifteen minutes” away. Hotel Gran Casa Xalisco, a member of Historic Hotels Worldwide since 2016, dates back to 1895. Hotel Gran Casa Xalisco offers unique accommodations in the center of Guadalajara, a few blocks from the Cathedral and historic monuments, and just in front of the beautiful Saint John Baptist Church. 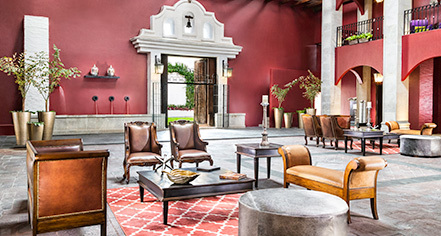 The hotel is built in a beautiful house with a large center courtyard, dating back to 1895. Learn more about the History of Hotel Gran Casa Xalisco .